Posted by markus on 2008/10/01 . Leave a comment. As foam masses upon the surface of the fountain at Sergels Torg, clouds form and rise slowly into the air, loosely encircling the obelisk. Light shatters upon the 80,000 crystal prisms of Kristallvertikalaccent, which becomes enveloped in a ﬁeld of rising clouds. In a space composed of hard edges and glass surfaces, of exposed concrete and heavy trafﬁc, the foam clouds appear fragile – they move slowly, softly defying gravity. They drift across the city. moving beyond the enclosure of Sergels Torg. As they rise and disperse and get lost amongst the real clouds, new clouds form at the base of the obelisk. The process is continuous. It takes time. It is, after all, a performance. Monument No. 5 is performed over 4 days. It precedes the changing of the water of the fountain and the cleaning of Kristallvertikalaccent.The 80,000 prisms of the obelisk reﬂect the light of 365 different days every year, and every day the light of those prisms is frozen in time, captured and reproduced as representation in glossy press shots and the digital photographs of tourists. 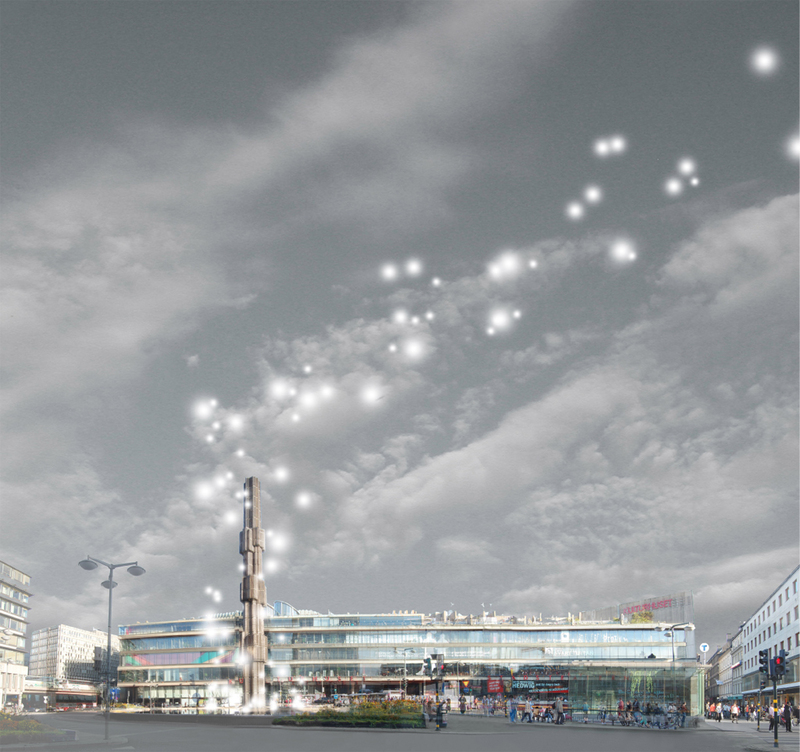 People experience the beauty of Kristallvertikalaccent in the creation or observation of its image – the moment of encounter is thus frozen and removed, placed in artiﬁcial sequences and sited outside of the physical space of Sergels Torg. The encounter with the artwork is in this way obscured – it is viewed through digital viewﬁnders and on computer screens, and the changes in light and colour and shadow, in the space that it takes and creates, are lost. 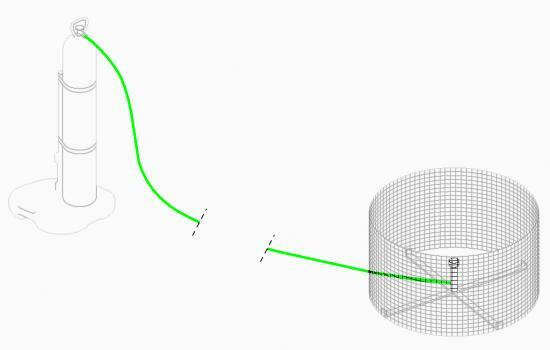 At the same time, the monument is experienced physically in repetitive everyday encounters as an obstacle to movement. Liquid bath foam is poured into the pool of the fountain. Sixteen 50 liter canisters of helium are placed along the edge of the pool. 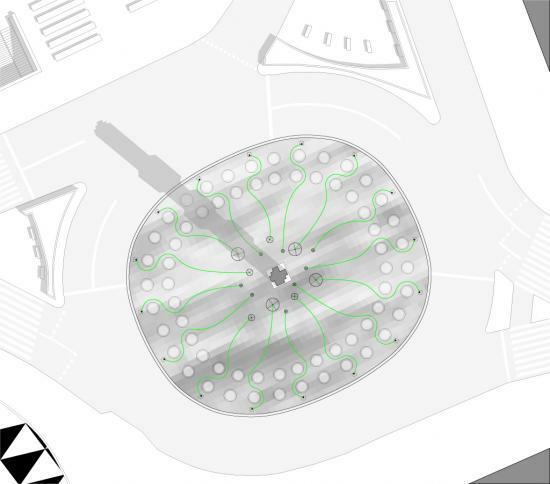 They feed helium into sixteen cylindrical cages placed in the water, closer to the obelisk.The helium is released into the soapy water and the bubbles create foam which is contained by the cages. 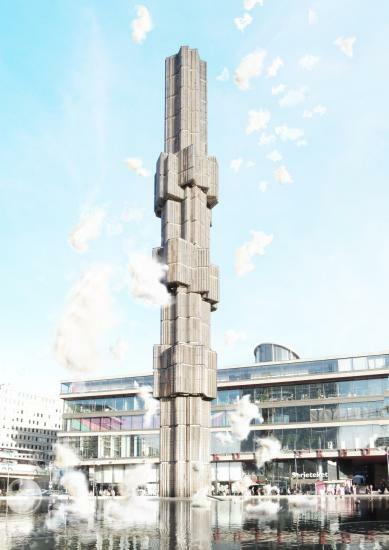 As the foam grows, the vertical force of the helium pulls away clouds of foam that rise along the obelisk, soaring away over the buildings of Stockholm.Different sizes of cages allow for different sizes of clouds that release at different intervals. Each canister of helium lasts for fifty minutes and every ﬁfty minutes empty canisters are replaced manually with new ones. The performance will last for four days, each day for seven hours.